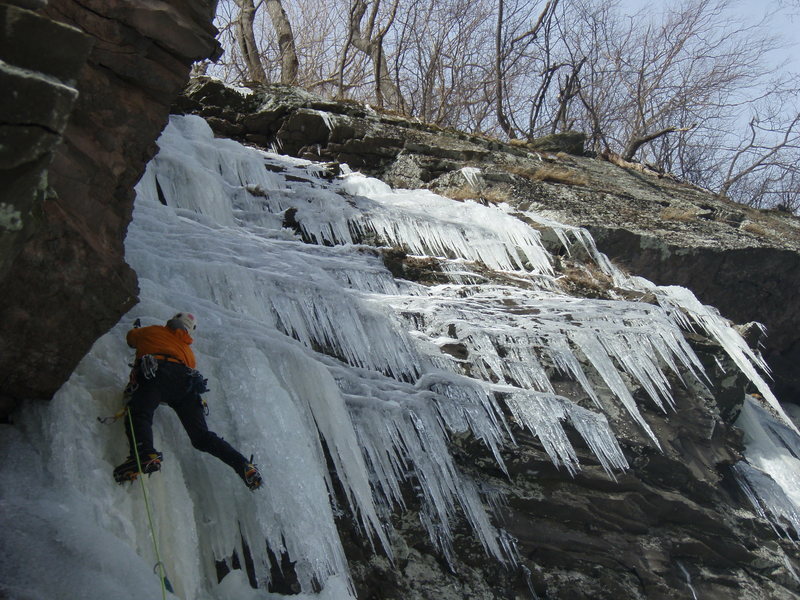 Dead vertical start gets to a small rest about halfway up, then a bit lower angle for last 30 ft.
Marty Molitoris on Little Black Dike, Stony Clove in December. Between Spiral Staircases and the Entertainer. The massive right-facing corner will be the sign you're in the right place. There are two trees above the climb as noted in the comments below. The highest tree anchor requires a 70m rope for descent. Two options for anchor tree up top: 1) step right to the tree close to the lip. 2) continue straight up past roots for 25 ft beyond the top of the ice. This tree provides a better located rope for the second or subsequent TR. BUT a 70m rope is REQUIRED.